Despite an early deficit, the Spartans rally in the second half behind freshman Margaret Shively. They're number one! And for a reason. Top-ranked Wilsonville came to Hillsboro Wednesday night, Feb. 6, and did what they do best — won. 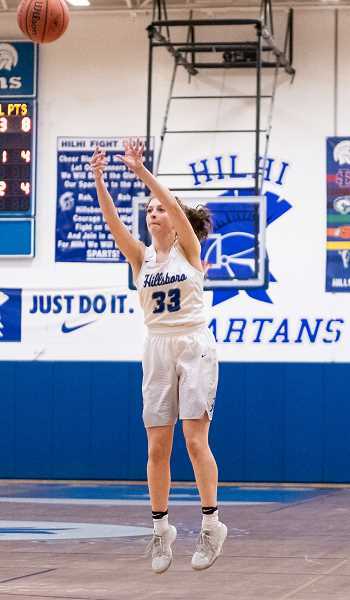 The visiting Wildcats defeated the Spartans 71-57 for their 14th consecutive win, and did so with a well-rounded attack that Hilhi had little answer for. But while handily defeated by the No. 1-ranked Cats, Hillsboro head coach Sara Harsin was proud of her girls for fighting despite a lopsided halftime deficit. "Once we loosened up and played in the second half, I thought we played well," said the coach. "The second string was playing good, and when we put the starters back in they did as well. We can play, we just have to realize it." In a bit of an unusual move, trailing 52-26, the Spartans (4-5, 10-9) coach put her entire first team on the bench just a minute into the second half. Unhappy with the energy from her starting five, Harsin went to the second string to provide a change of pace, and in this case it worked. Against the bulk of the Wildcat starters, Hillsboro's backups kept up, and by the end of the quarter had actually cut into Wilsonville's lead. "It could've gone either way and I'm glad it went the way it did," a chuckling Harsin said. "I have confidence in our second string. I was not happy with the energy and effort from the starters. They never gave up, but they had kind of dropped their heads and I wanted to see a different energy. And she got it by way of Margaret Shively. The freshman scored eight of her 15 points in that third quarter, and gave Harsin and the rest of her coaching staff a glimpse into what the future holds for the young guard. "Margaret, was big, and had a great game," said Harsin. "She's a freshman and we know there's always going to be ups and downs, but she showed what she's capable of doing. We saw that from her last summer, but she's doing a great job of moving in a positive direction." Wilsonville (9-0, 16-4) hit consecutive threes to start the game and built a lead as big as 12 points before Hillsboro closed it to 20-10 to end the first quarter. It was more of the same in the second quarter with the Wildcats' Sydney Burns and Emilia Bishop providing a lethal inside/outside punch en route to a 48-26 halftime lead, leaving Harsin with few answers for the top-ranked Cats. "Our game plan was shot by the time they jumped out to that lead," said the coach. "I wanted to slow it down, but it's just not what we like to do, so we need to find that balance. When they go up and down, they're better than us because they have size and can rebound, they're strong, they're athletes, so we have to find that balance of being able to do what we want to do, but also executing a game plan." Burns opened the second half with a lay-in, then when Bishop followed shortly thereafter with a basket of her own to put Wilsonville ahead 52-26, Harsin had seen enough, and went to her bench. 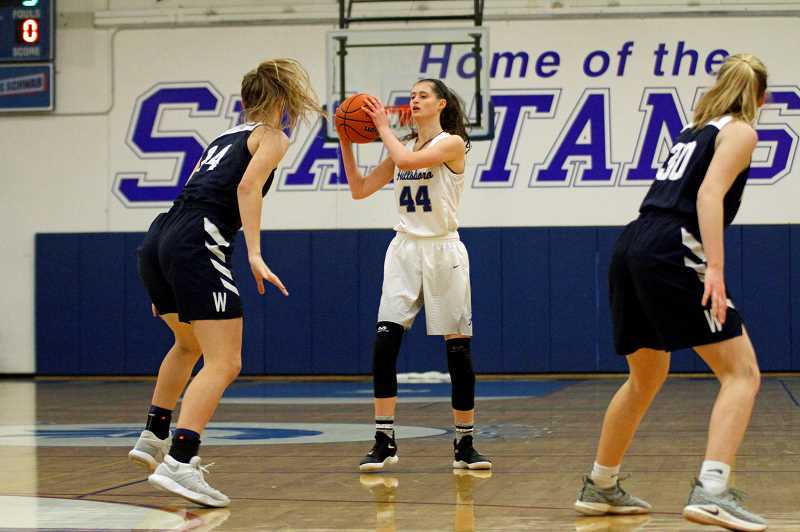 The Spartans — thanks primarily to Shively — scored 10 of the game's next 14 points, and by the time the starters returned at the first part of the fourth quarter, the lead had been cut to 18 and there was life in a once demoralized Hilhi squad. Harsin admitted the move to play the second string so early was a bit unorthodox, but felt — at least at the time — that it was the right thing to do. "Rarely would be put five reserves out at once, but they were aggressive and just wanted to play basketball" Harsin said. "They did just what I wanted them to do. And the starters kept their heads in the game, cheered on the girls on the floor and then did well when they came back in." Well enough to keep the Wildcats' starters in the game essentially 'til the end, and by that end, Hillsboro had outscored the visitors 31-23 in the second half, which was ultimately not enough for a win, but something to lean on in defeat. Despite the loss, Harsin said she hoped her team could use what they learned in that second half and apply it over the season's final five games en route to a possible playoff bid. "We need to play free, but smart together, and have fun doing it," she said. "We need to feed off this energy and get back to doing what we do well." In addition to Shively, the Spartans got 13 points from Kylie Fernstrom, 12 points and 10 rebounds from Rian Porter, and 11 points from Dylan Kem. Wilsonville was paced by Bishop's 21 points and 13 rebounds, along with Burns' 16 points, 10 rebounds and seven assists. Hillsboro is next scheduled to play at Putnam Tuesday, Feb. 12, at 5:30 p.m. and will host St. Helens, Feb. 15, at 5:30 p.m. at Hillsboro High School.